Barack Obama, left, hopes his sweep of John McCain in the bobblection is a precursor to November's general election. 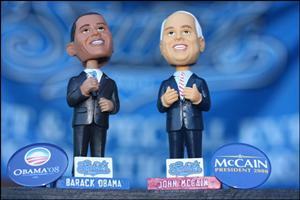 Each of the six Goldklang teams started their election night with an equal amount of Obama and McCain bobblehead dolls. Fans were asked to choose one. The candidate who ran out of bobbleheads first was declared the winner. The bobblection kicked off in Hudson Valley, where Obama edged McCain by 37 votes. Obama followed with a surprisingly slim 44 vote win in Brockton. The bobblection truly turned to Obama on the third night. The fact that McCain’s South Carolina primary election office was across the street from Charleston’s ballpark did little to help the Arizona senator, as Obama’s 58.1% tally produced the highest differential in the bobblection. “I think that’s the one that threw me for a loop, because this is a red state,” Pfander said. Obama carried St. Paul by nearly the same amount, then finished the sweep by grabbing 55.2% of the vote in Sioux Falls and 54.4% in Fort Myers. While the basic concept was the same throughout the Goldklang Group, each club was able to add their little touches to the night. Local campaign workers for both candidates attended most of the events, many lining up in Fort Myers an hour before gates opened. Once inside McCain and Obama staffers often found themselves in shouting matches over their candidate’s qualifications. Charleston borrowed the city’s electronic voting machines to poll fans on their feelings about the designated hitter and artificial turf. For the presidential portion of the election, however, the RiverDogs asked fans to cast their ballot from the appropriate Porto-potty, McCain’s (labeled John in the john) or Obama’s (Barack in the bathroom). St. Paul had Al Franken, the comedian/talk show host turned candidate for one of Minnesota’s U.S. Senate seats, throw out the first pitch. The likenesses of several other political figures were also present. Along with having a little fun at the expense of the election, the Saints also called out former presidential candidate John Edwards for cheating during a between-inning contest, and Ralph Nader kept the team of John Kerry and Al Gore from reaching their goal during the three-legged race.